After saying goodbye to Rachael and Steve and being picked up by the Kiwi Experience bus in Cambridge, we headed to Rotorua. 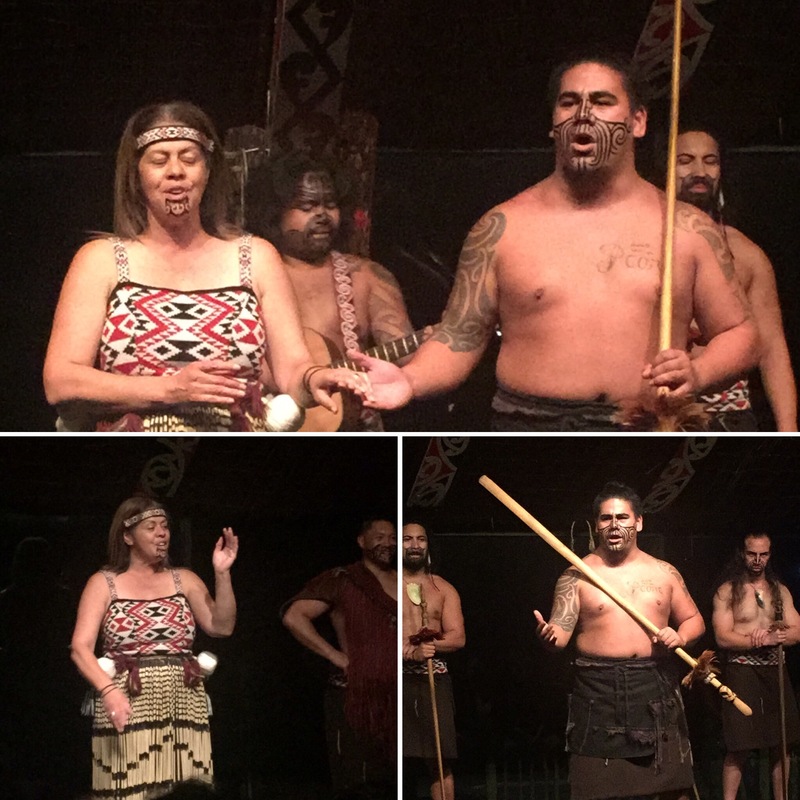 We would only be there for a couple of hours though before we were taken to the Tamaki Maori Village for an overnight stay to learn all about the Noho Marae tribe and Maori culture. This trip was the most amazing experience. 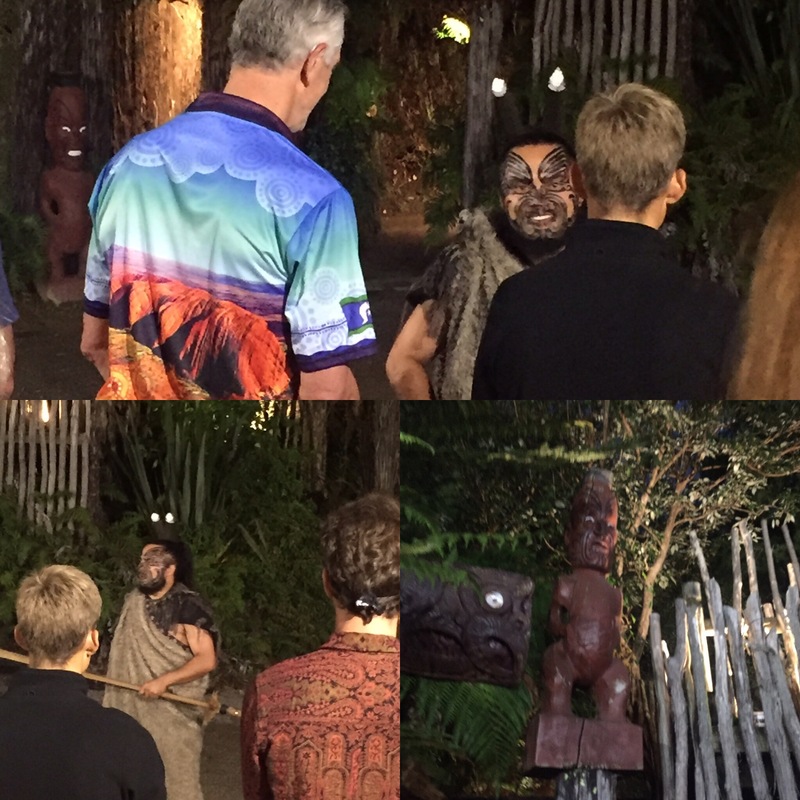 We were first welcomed into the village by some Maori words and a welcome song. We had to elect a chief (ours was a guy called Shane) and then he had to perform a greeting called the ‘hongi’ which was where you pressed your nose with their chief (our host Jameson) twice and say ‘Kia Ora’ (the Maori greeting) and then share one breath (a life breath) and that was to also symbolise the ancestors that we had all lost. They do a lot to acknowledge the ancestors of theirs and ours which I think is really nice. 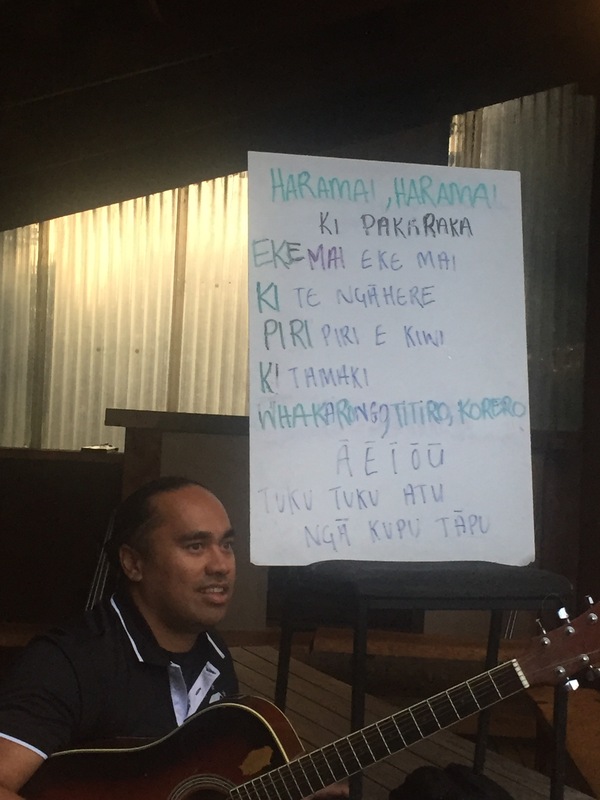 Then we went into the dining room and they did a song (this was with another lady called Leada – we later found out she was Jameson’s sister) and then our ‘chief’ had to say a greeting and then we had to do a song. We sang ‘twinkle twinkle little star’ because it was a one all of us knew – random I know. It was then time for food and it didn’t disappoint! We had shortbread, banana bread with cream and these amazing deep fried breads that were the texture of a donut or yum yum along with coffee, tea and hot chocolate – we could have as much as we wanted and were all stuffed when we had finished! 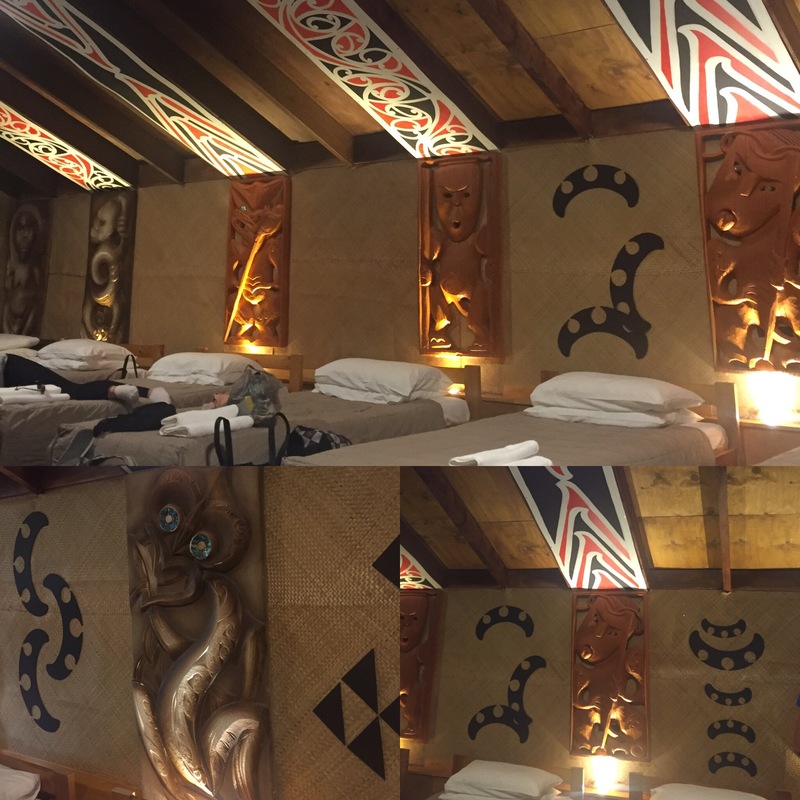 We were then shown to our beds; a big 20 bed dorm with carvings on the outside that represented our ancestors. The triangle of the roof was the arms welcoming guests in and then there were four finger tips on the end of each arm for birth, life, death and the afterlife. The house represented the anatomy of a person with this theme carrying on inside. The ceiling panels of the inside of the house represented the spine and the ribs with the two support pillars that came down to the floor representing the heart. The pillars support the roof from collapsing which represents the function of our heart so I think it’s a really clever way to look at it. There were loads of carvings that represent the spirits and the gods that they believe it like earth, wind, sea etc. They don’t properly worship them them though, it’s more that they are seen as gods that give us things to live on this earth so they’re respectful and thankful but in more a ‘mother nature’ way than a God. 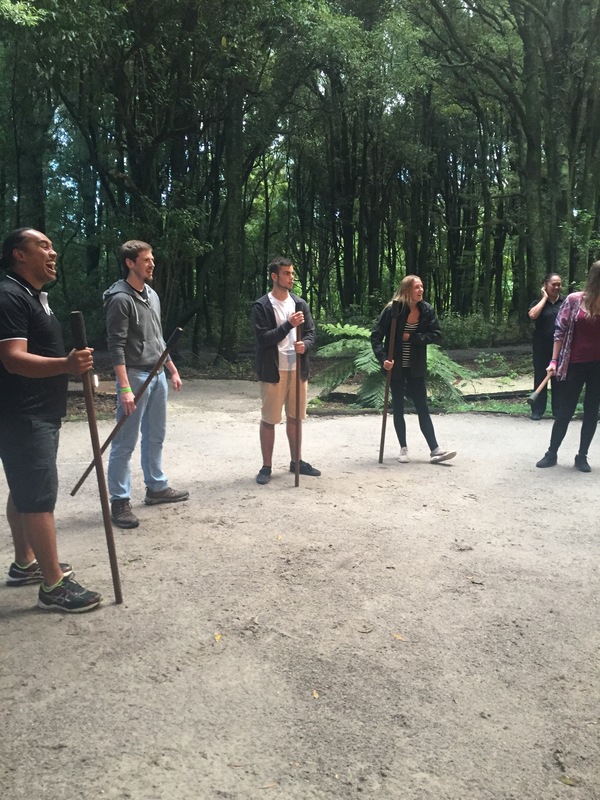 We then went into the woods and played some games used in traditional Maori culture to train them for combat – improving their coordination and agility. We were all given sticks and had to stand in a circle facing each other. 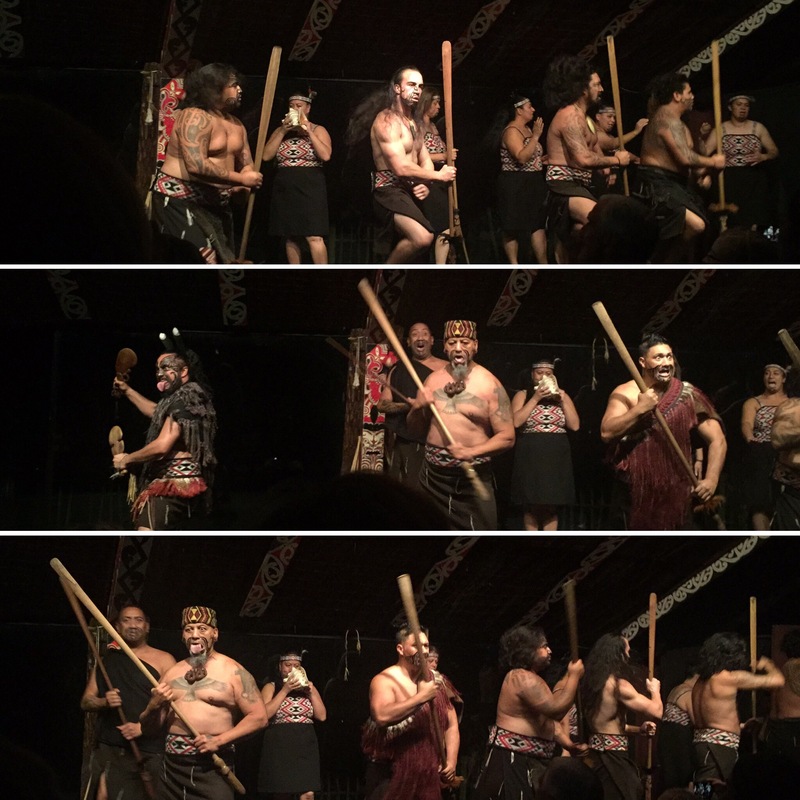 We would then chant something in Maori and throw the stick to the person on our right without looking and catch the stick that had been thrown to us by the person on our left at the same time – needless to say, it was difficult! We then had to throw the stick to the second person along from us, missing out the first person, which became quite dangerous! It was hard to not throw the stick too hard at someone when you couldn’t see where you were throwing and the circle was never able to catch every stick thrown at the same time without at least one being dropped (and we tried a lot of times!) This game would be played by Maori warriors to improve their hand-eye coordination and it’s actually really hard! We all had so much fun playing the game and it was a good bonding exercise for us all. 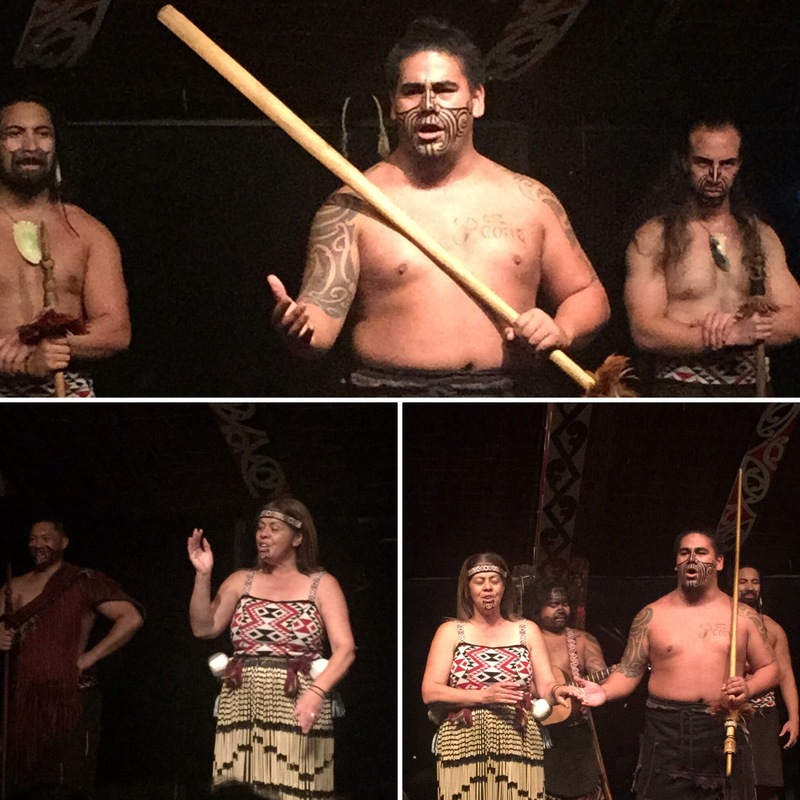 We then were taken to a bar area where we were taught a song in Maori which we would then be singing later on that evening to all the other guests (around 160 people). The song was to the tune of ‘Stupid Cupid’ which was sung in the film ‘The Princess Diaries’. 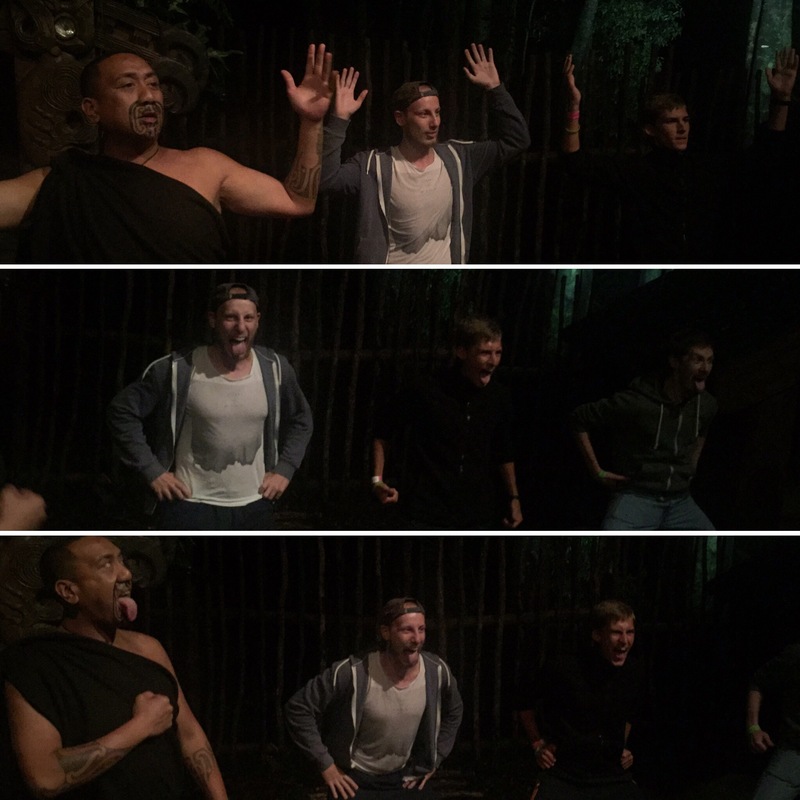 It was really cool learning some Maori and we had a laugh doing it, especially when we also had to do hand actions to go with the chorus! As we were all having such a good time, we lost track of time and had to rush over to the beginning of the evenings activities. This also had a lot of other people there as it was a public evening entertainment as opposed to the afternoon that was privately for us. 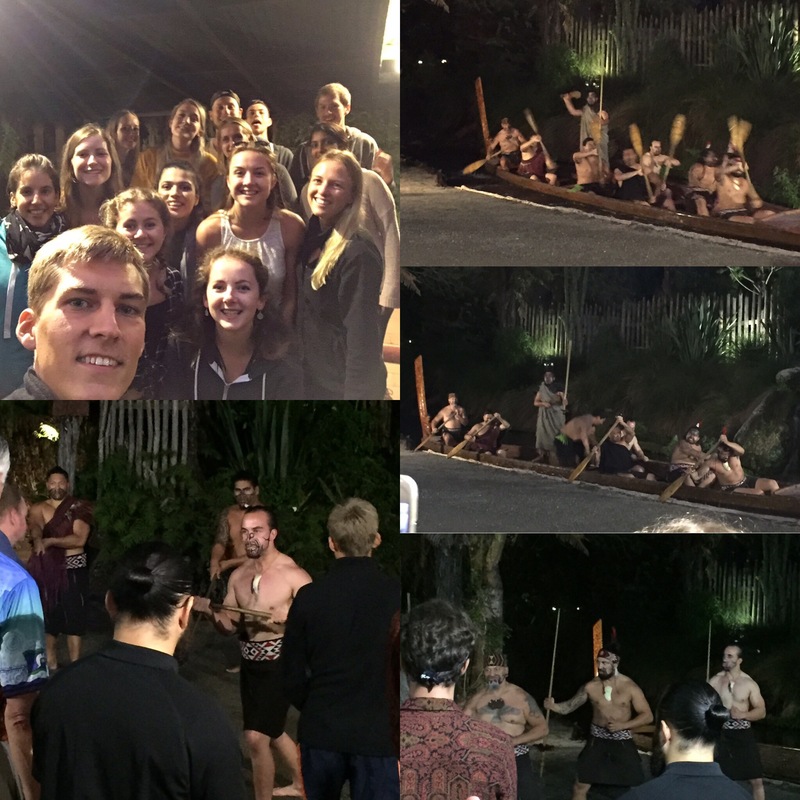 The evening’s activities were a traditional ceremony which started with a tribal welcome. The nominated chief from each group (our’s being Shane) introduced us all (we had all been given names for our tribes), accepted a present (a big fern leaf) and did some other tribal formalities with the Tamaki Village chief. The tribe arrived by giant canoe and did the Haka which was really cool to see. 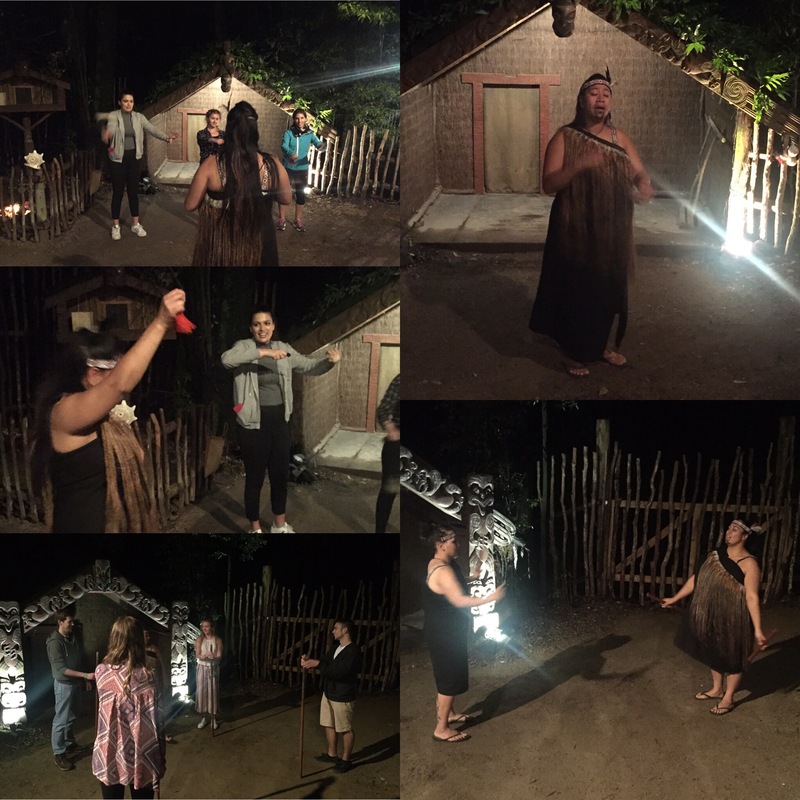 We were then taken into a replica of a traditional Maori village and we moved from station to station where we were told a little bit about a different aspect of Maori culture. 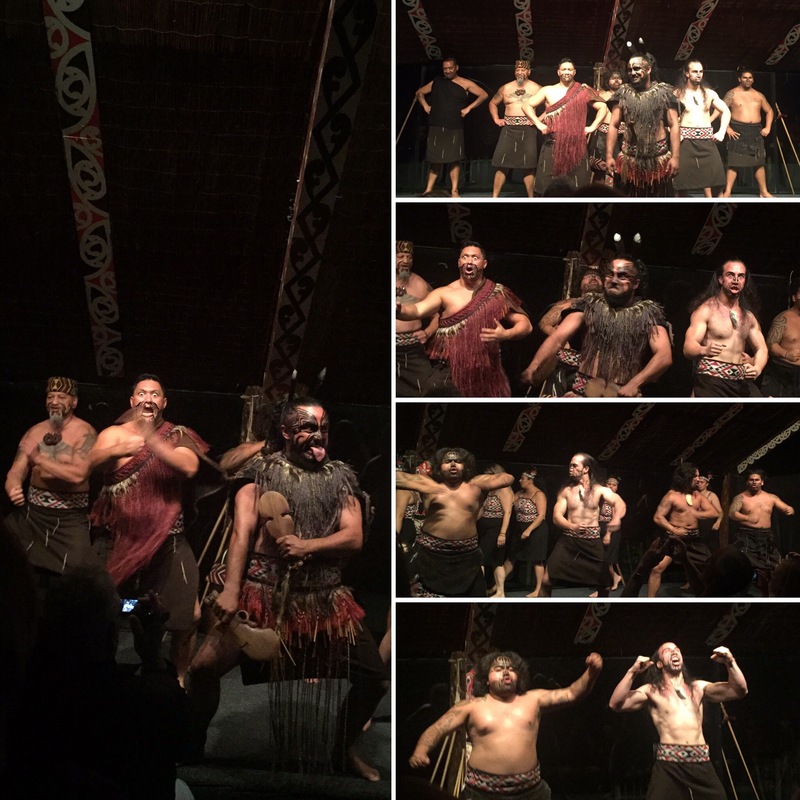 We were told about Maori culture and traditions, how the Maori’s arrived in New Zealand, some more activities to help the warriors with their strength and coordination and the males got to have a go at the Haka. 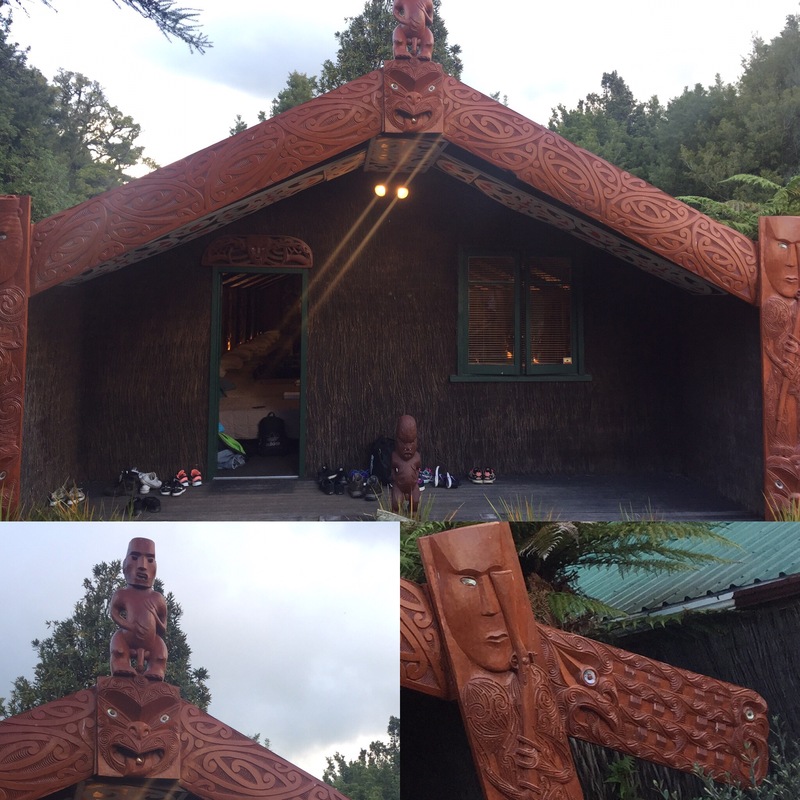 It was really interesting going to the different stations but it was time for the unveiling of the Hangi. 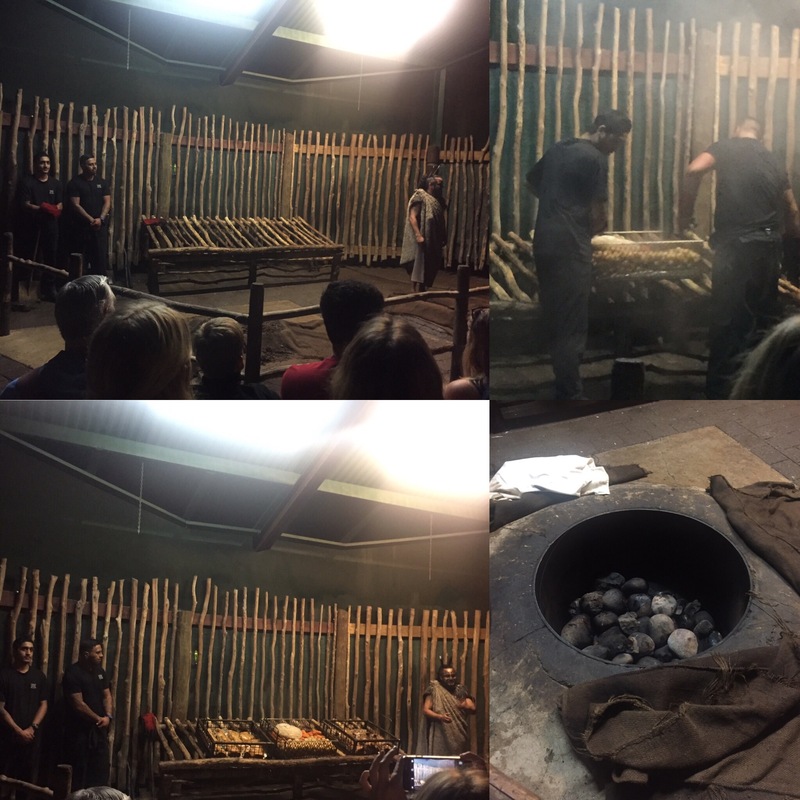 A Hangi is a traditional Polynesian style of cooking (Hangi being the Maori name for it) in which the food is cooked in a one meter by one meter pit underground using white hot stones that have been on a fire and then buried to slowly, steam-cook the meat and vegetables. We were then taken into a concert hall while the last preparations of the feast were completed. 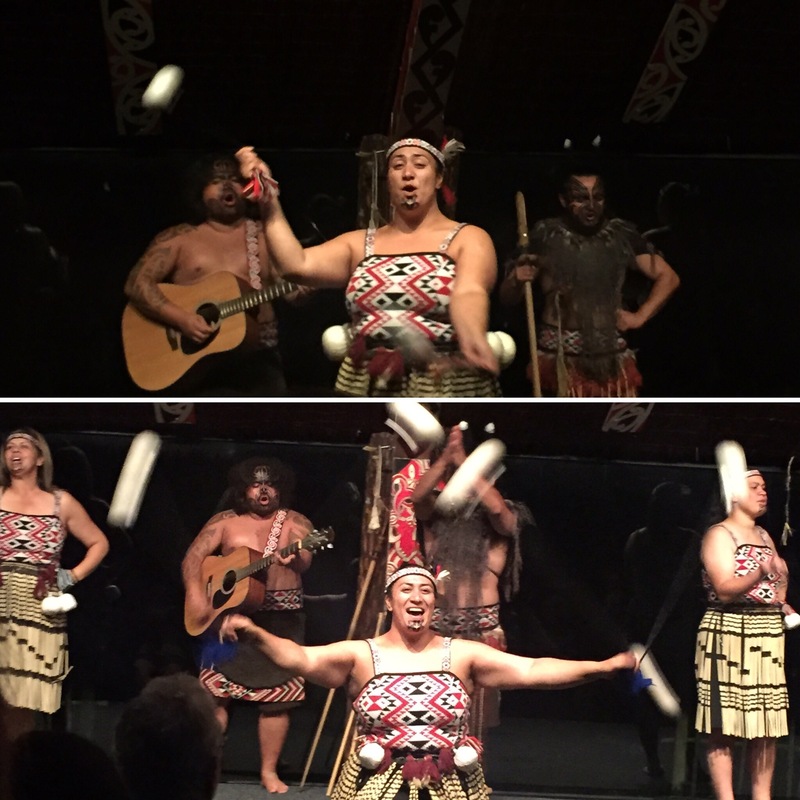 Whilst in the concert hall we were shown a range of traditional songs and dances by the Maori men and women. 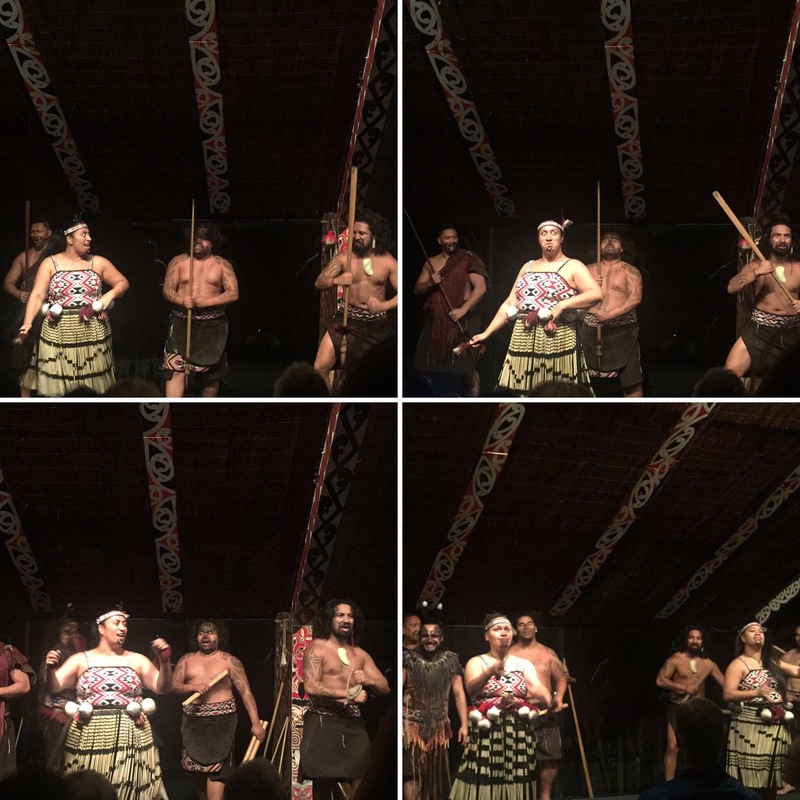 They were really good singers and we also got to see a traditional Haka which we were so pleased to see – it was quite intimidating and great to watch. After seeing the food taken out of the pit in the ground, we were looking forward to the feast – especially as we’d heard such good things by it! It was an all you can eat buffet and all the food was amazing! There was fish, lamb, chicken and loads of vegetables which were all perfectly cooked. We both had two plates of food (had to get our money’s worth after all and we didn’t know when we would next eat so much food) and then also had dessert which was pavlova (YUM!) Ever since we had stayed at Anne’s in Perth we had wanted to have pavlova again (Anne, if you’re reading this, we vote yours to be the better pavlova of the two). 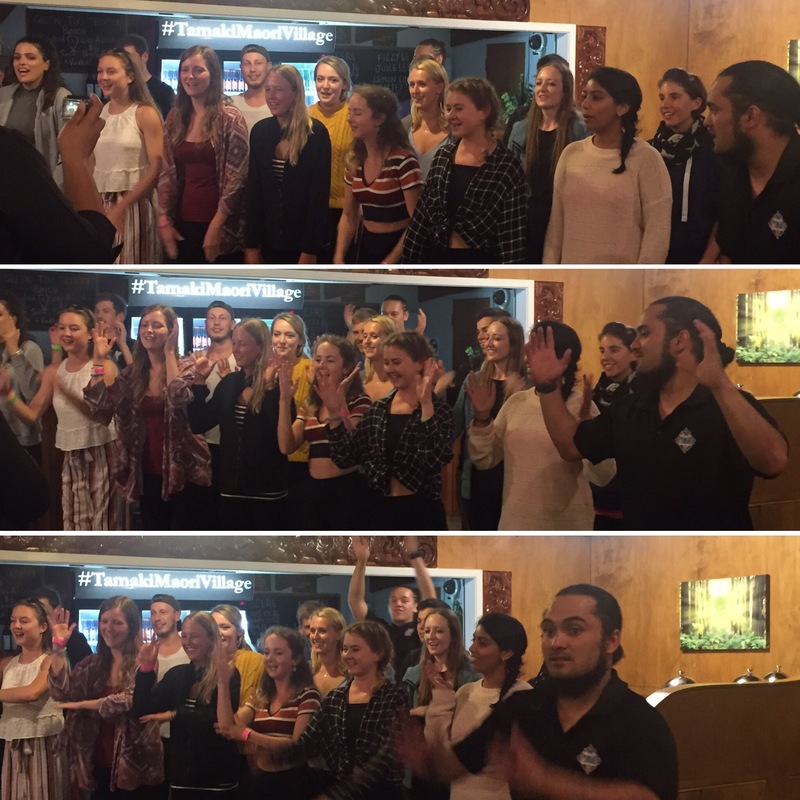 After dinner, despite not wanting to move at all from being so full, it was time for us to perform the Maori song that we learnt. Thankfully, we still had the words in front of us or I don’t think any of us would have remembered them and we all managed to get through it relatively painlessly. Once we had sat down we were then completely outshone by the village staff who did their own song for us all. 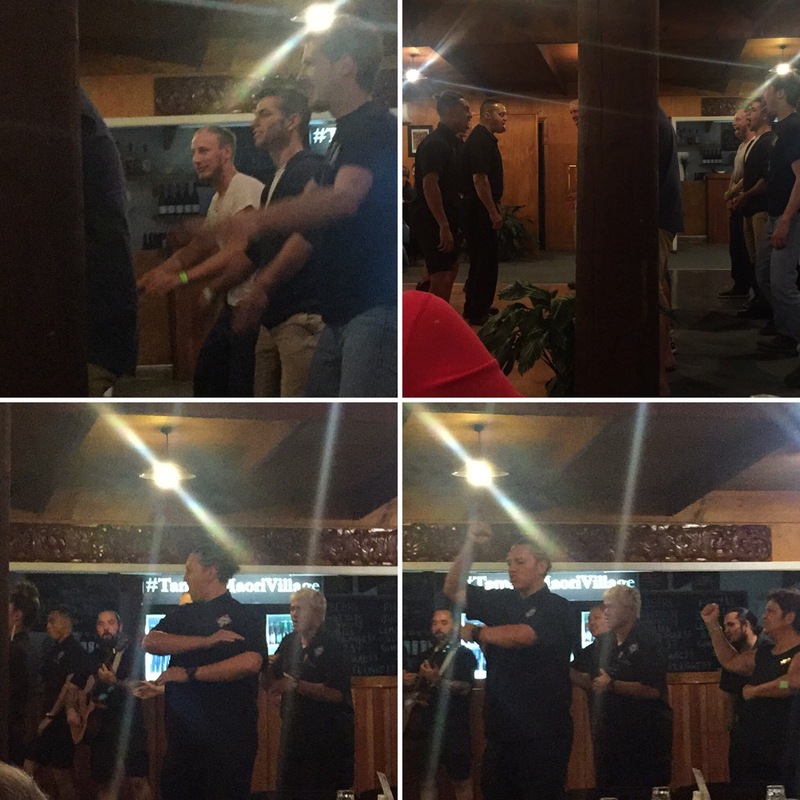 All the men at the dinner also got invited up to take part in another Haka – it was a shame the women couldn’t join in to get to have a go but oh well. The other guests went home (we were the only ones sleeping over) and so we changed into our swim wear, went into some hot tubs under the stars and roasted marshmallows on the fire – the whole evening was lovely. We chatted to the chief who turned out to be our host Leana’s husband and we learnt all about their family (5 kids aged 12, 9, 7, 6 and 2 months – now that’s a handful!) 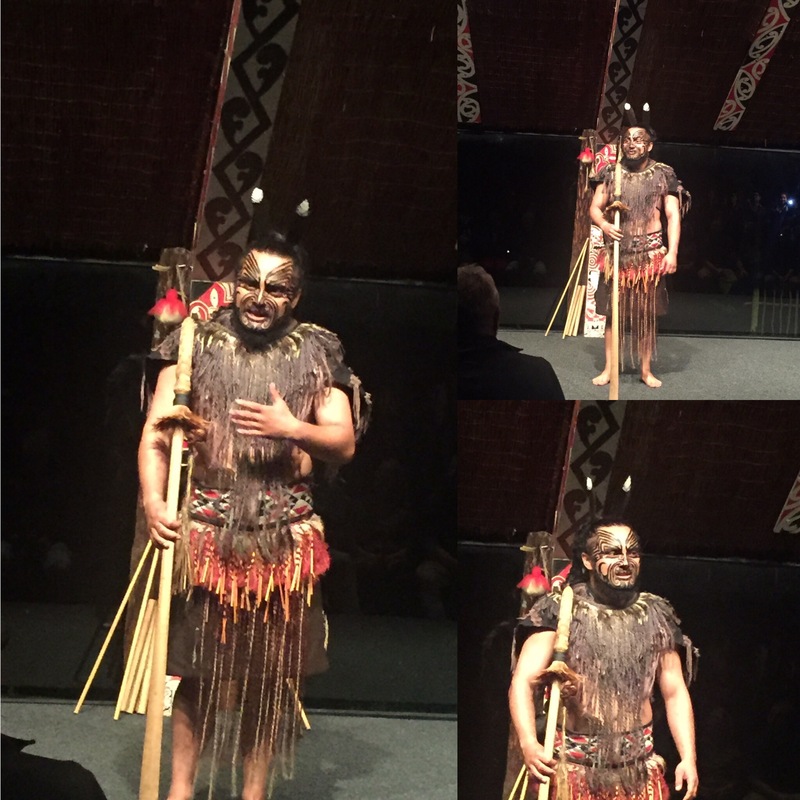 He spoke to us about the Maori culture in more detail and we learnt that traditionally, the Maori tattoos were carved into the flesh again and again so that it properly scarred into their skin (OUCH!). It was really interesting speaking to him and we found out that a lot of the staff working at the Tamaki village were all related, with a lot of them also having other jobs like teaching or gardening. Our host Jameson who had welcomed us to the village that afternoon was even in some Hollywood films! The whole day was such an incredible experience and really interesting. 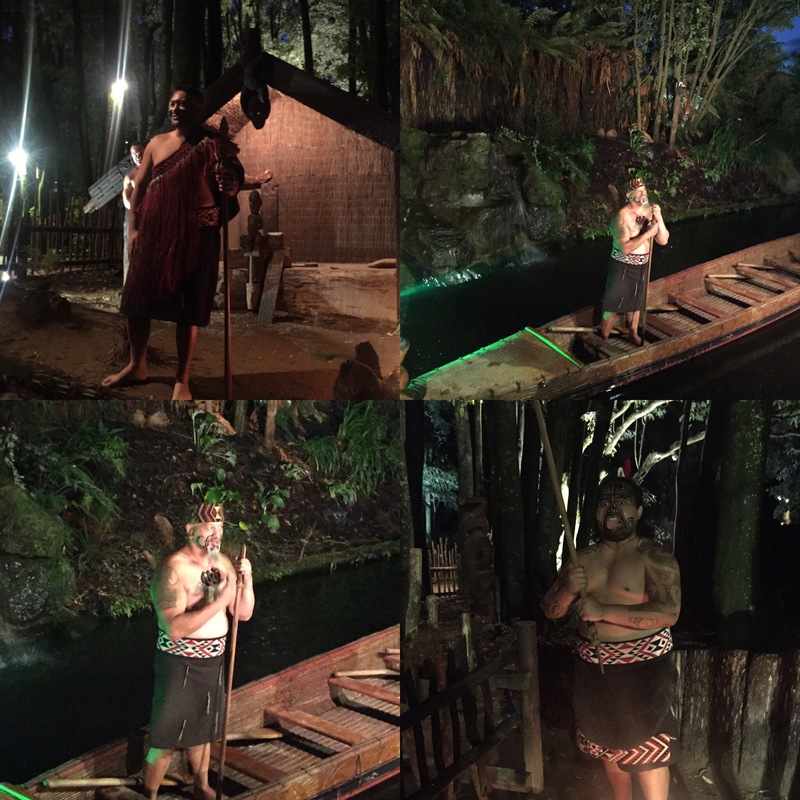 We were so glad we chose to spend the extra money to do the longer Maori experience as we got so much more out of it and it was lovely seeing that their traditions and culture still lived on after all of this time. 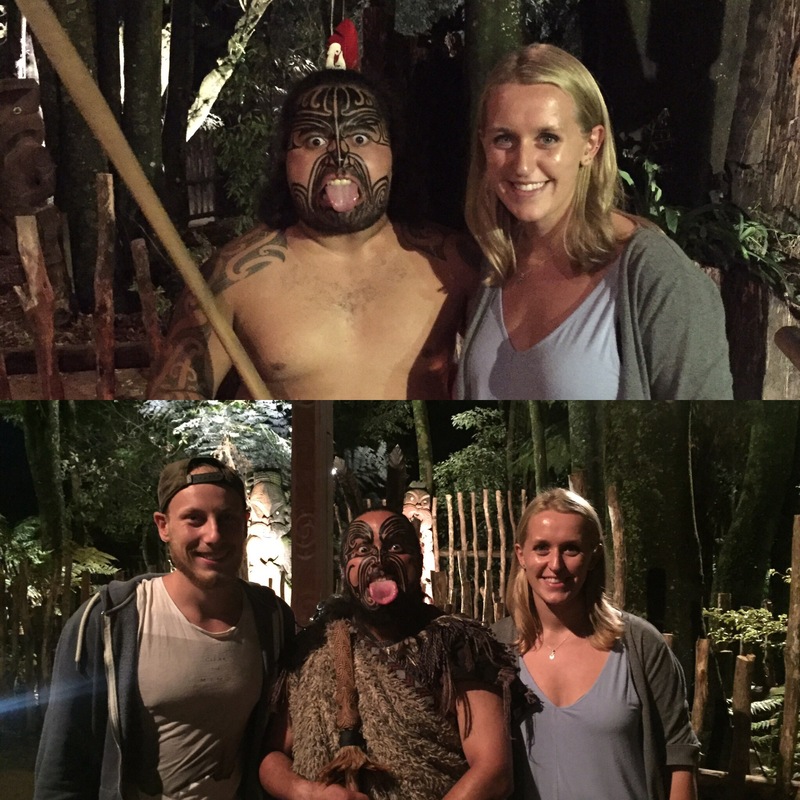 We would recommend the Tamaki Maori Village to anyone who was going to Rotorua.